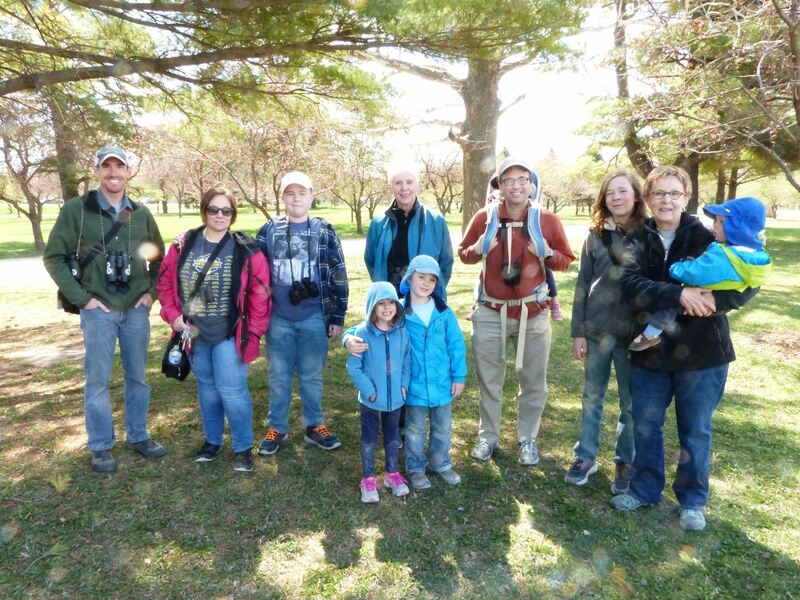 Twelve young birders, parents, grandparents, and friends spent a gorgeous Iowa spring morning searching for migrants and learning about birding basics at Des Moines Water Works Park near downtown Des Moines. We started the morning with a short exercise on using binoculars and practiced our skills on a distant sign. With several different habitat types yet to explore, we started off in search of birds all the while discussing what to look and listen for that can help with identifying birds. For example, observing different bird behaviors (e.g., tail bobbing) and the microhabitat within which the bird is (e.g., forest understory or forest canopy) can greatly help to pinpoint which species you see. We had the opportunity to practice these observation skills on a Yellow-throated Warbler singing high in the treetops. Luckily, the bird came down to mid-level in the tree for all to see! Not long before an adult Bald Eagle was seen soaring high overhead. We continued through the park. American Robins and Chipping Sparrows were numerous, and we stopped to observe an occasional Tree Swallow, Barn Swallow, or Chimney Swift overhead. A distant Mourning Dove had us all fooled into thinking it was a raptor until we approached, and a couple of Killdeer in an open grassy field were very cooperative. Now on to the wetlands! We were quickly greeted by a couple Canada Goose families, the goslings dutifully following the parents into the water as we approached. Double-crested Cormorants were occasionally flying overhead and eventually landing gracefully in the water. Oliver spotted a Great Blue Heron in the distance, which sat tight as we approached to offer clear looks for all. A Red-tailed Hawk was also perched in a distant tree. A Mallard pair joined the Canada Goose families, and several Blue-winged Teal and Northern Shovelers were seen on a distant pond, the colorful males of both species clearly visible from a distance. We finished the morning hiking along a couple more wetlands near the parking lot. Although the birds were quiet, the Chorus and Northern Leopard Frogs were very vocal! Many thanks to all those who attended our trip on this gorgeous morning! You can view our species list here and some photos from our trip here. Iowa Young Birders member Coralee Bodeker authors and illustrates her regular column, "A Prairie Girl's Notebook" from her home near Vinton, Iowa. Coralee received Honorable Mention for her writing and art among young birders across the nation in the 2018 American Birding Association Young Birder of the Year contest. Enjoy this recent issue about her observations of a House Wren pair near her home. Thanks Coralee, and congratulations! The Iowa Department of Natural Resources invites all to attend the 15th Annual Prairie Chicken Day at the Kellerton Bird Conservation Area on Saturday, April 7, 2018 starting at sunrise. The event will take place at the viewing platform on 300th Avenue near 242nd Street southwest of Kellerton. Click here for a map of the location. Afterwards, the Kellerton Bird Conservation Area will be dedicated as a Globally Important Bird Area by Iowa Audubon! Help celebrate this important area for Iowa birds and enjoy seeing Greater Prairie-Chickens during their annual lek display! It was a brisk Iowa morning on February 10, 2018 when 10 young birders, parents, and friends embarked on a winter birding adventure at George Wyth State Park near Waterloo. Despite the cold, the sun was shining and the birds were active. We were excited to begin the search for our target birds, the Northern Saw-whet Owl, Red-shouldered Hawk, and Pileated Woodpecker! We started the morning listening to some of the early singers such as Northern Cardinals, White-breasted Nuthatches, and Black-capped Chickadees near the park entrance. While listening to these birds, we noticed a large bird flush from a nearby pine tree. After a few more views of the bird, we surmised it was a Barred Owl. Shortly thereafter, volunteer leader Connor Langan spotted a flock of 25 Common Redpolls overhead. An exciting and unexpected sight only 30 minutes into the trip! We then headed towards the bird blind to search for Northern Saw-whet Owls. We learned about Northern Saw-whet Owl winter habitat from volunteer leader Tom Schilke as we hiked back toward the owl location. We stopped off at the bird blind to watch the feeders for a few moments, and enjoyed close-up views of Red-bellied, Downy, and Hairy Woodpeckers, Black-capped Chickadees, Northern Cardinals, and other winter songbirds. We continued our hike, excitement building as we grew closer to a stand of Eastern Red Cedars known to host saw-whet owls in winter. After about 5 minutes of searching, volunteer leader Connor Langan located a single Northern Saw-whet Owl! We carefully snuck back to enjoy fantastic views of the tiny bird, conducting what we all termed the “saw-whet shuffle”. As we hiked back towards the parking lot, we heard and saw a pair of Red-shouldered Hawks overhead. Two of our target birds in in five minutes! Our last stop was a series of bird feeders in the center of the park, near where we saw a flock of Wild Turkeys earlier in the morning. Most numerous at the bird feeders were House Finches and American Goldfinches, and we also spotted another Red-shouldered Hawk nearby. It was a fun end to a great morning! We’re grateful for the leadership of volunteers Tom Schilke and Connor Langan. Their expertise and local knowledge made this trip a huge success. You can view photos from our trip here as well as a species list, compiled by Connor Langan, here. 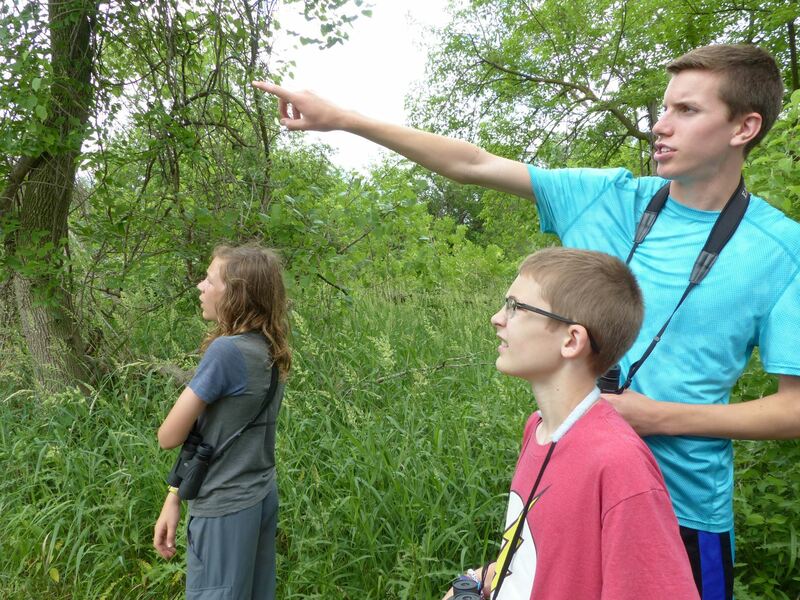 What an exciting year 2017 was at Iowa Young Birders. We led young birders and their families on 10 trips across the state, released our unique optics rent-to-own program, and much more. You can read more about our exciting year in our 2017 Year-End Report here. Many thanks to YOU for supporting us along the way! We're looking forward to 2018! 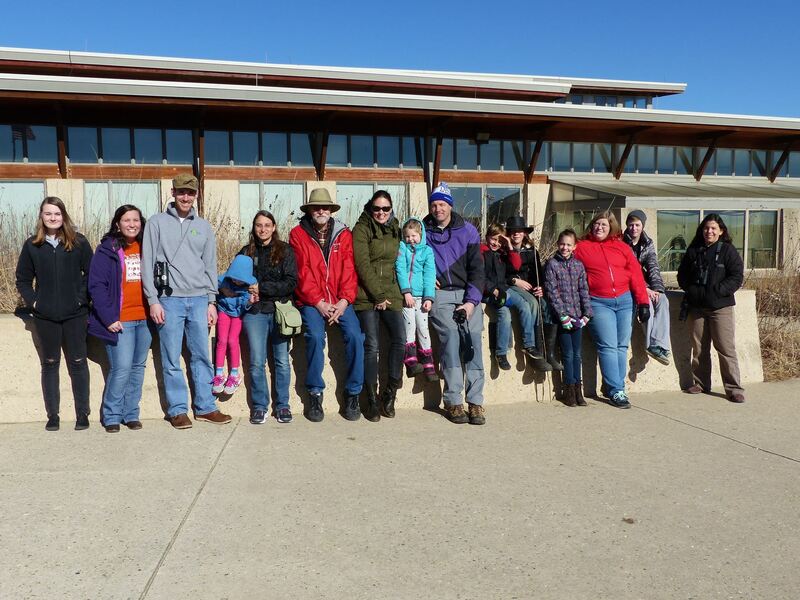 On January 27, 2018, 18 young birders and parents kicked off the 2018 field trip year at Neal Smith National Wildlife Refuge for our Junior Duck Stamp Day. Brian Murillo, award-winning wildlife artist who has placed in both the Junior Duck Stamp Contest and the Federal Duck Stamp Contest, graciously joined us to share tips about sketching and painting waterfowl for the Junior Duck Stamp. Young birders were excited to get started! Doreen Van RysWyk, coordinator of the Junior Duck Stamp Program in Iowa, started our exciting morning with a brief overview about the Program. Doreen shared with us the history of the Federal Duck Stamp Program, which has deep roots in Iowa. The first winner of the Federal Duck Stamp Contest was Iowa cartoonist Jay Norwood (“Ding”) Darling, and the only five-time contest winner is Iowa wildlife artist Maynard Reece. Young birders learned how art contributed to both the Junior and Federal Duck Stamp Programs has had a huge impact on habitat restoration and conservation education. Next, Brian shared with us how his passion for wildlife art started, sketching and painting all sorts of birds and other wildlife as a kid in central Iowa. He provided valuable tips to young birders on creating a life-like painting or sketch of waterfowl and other birds. We learned the importance of contrast between the bird and background, about establishing a light source, and about scale of the creation. Young birders then put these tips to work by sketching birds of their choice while Brian provided advice and encouragement. An Eastern Bluebird, Bufflehead, Hooded Merganser, Wood Duck, Piping Plover, and Redhead emerged on paper. What amazing talent our young birders have! Young birders then presented their artwork to the group and shared why they chose their bird of interest. We finished this activity with some “Duck Trivia”, learning about life history characteristics of waterfowl. Taking advantage of the unseasonably warm day, we finished our morning with a brief hike around the Prairie Learning Center. Raptors provided the best show, with both Red-tailed Hawks and Bald Eagles soaring overhead. We were lucky to see the resident Bison on the Refuge and observed a recently-burned portion of the prairie and learned about the importance of prescribed fire for managing prairie habitats for birds. We have many people to thank for this fun day. First, a huge thanks to Brian Murillo for taking the time to share with us his passion for wildlife art and some tips for becoming artists, as well as for the amazing Wood Duck prints! The day would not have been possible without the assistance of Doreen Van RysWyk, and we’re grateful to Neal Smith National Wildlife Refuge for hosting us and for providing snacks. And, as always, many thanks to our young birders for their enthusiasm for birds and for art! You can view photos from our day here. 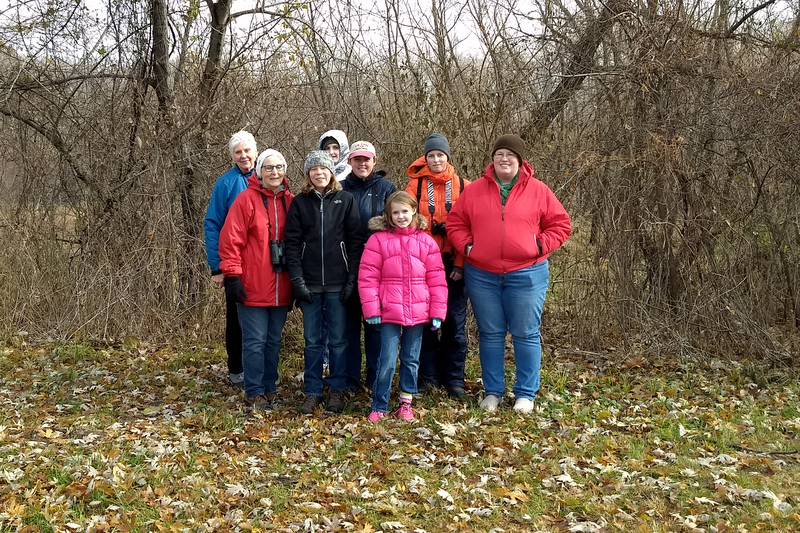 Nine young birders, parents, grandparents, and volunteers enjoyed a brisk fall morning birding below the Saylorville Dam near Polk City on November 18. The wind was howling, but we were still able to tally 27 species with the two best birds being raptors: Red-shouldered Hawk and Merlin! You can view a couple photos from our trip here and a complete species list here. Many thanks to Ulrike Grimaldi and Denny Thompson for their leadership and expertise!